More than half a million people in Florida are living with Alzheimer’s disease, the single most common cause of dementia. 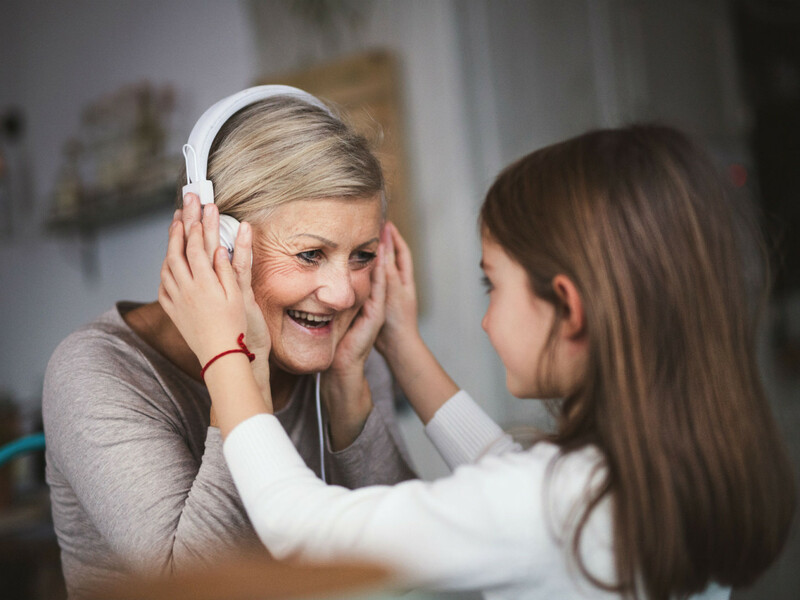 While most of these will be cared for by an adult child or spouse, few of those thrust into the caregiver’s role have received any formal training on how to provide dementia care in the home or, for that matter, any setting whatsoever. In the next 10 years, Florida is projected to be home to 720,000 residents with Alzheimer’s disease, and possibly more since many older adults fail to receive a proper diagnosis. Dementia is a disease that causes damage to the brain. The impairment this causes creates confusion that can be baffling to the person and ultimately exhausting to the caregiver. In addition, it triggers a litany of other behaviors that can be distressing for both. Those who are undergoing memory loss or cognitive decline due to Alzheimer’s or dementia, as well as those who care for them at home, enter a world which can be strange and confusing. Knowing how to deal with certain behaviors can significantly improve quality of life. Sonata Senior Living is a resource for caregivers. We offer services, information and understanding to caregivers managing the day-to-day situations and behaviors associated with Alzheimer’s and dementia. 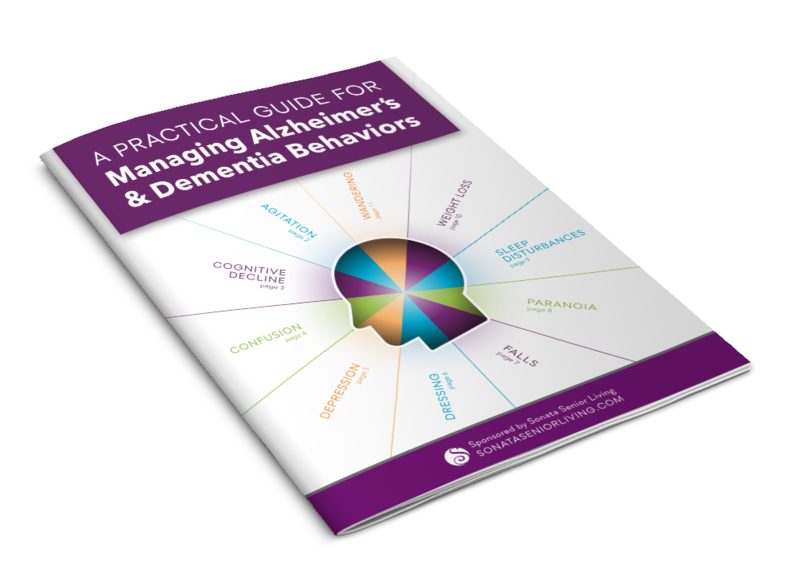 Relying on experts in the field, we’ve compiled a short yet comprehensive primer in managing Alzheimer’s and dementia symptoms and behaviors. 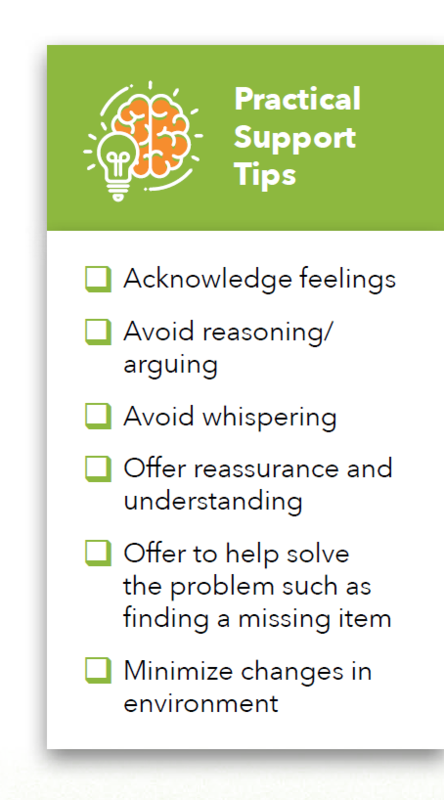 Using general guidelines, we offer practical strategies used by our certified dementia care experts to manage the daily challenges that accompany dementia caregiving. Agitation, one of the most common symptoms of dementia, is particularly noticeable as the day winds down. A time of day coined by healthcare professionals as “sundowning,” late afternoon changes often cause people with dementia to become restless and agitated. Do not underestimate the importance of feelings and human touch. Preserve your loved one’s dignity by validating their feelings of frustration using a gentle tone of voice or understanding touch. Distracting or redirecting the person in your care to a different activity can alleviate agitation. Suggest a walk, new activity or favorite snack. Or, provide a comfy blanket and box of familiar objects such as family photos or collectibles. Helping to change the dementia person’s perspective with an activity will diminish agitation. Creating a comfortable ambiance has been proven to play a role in alleviating symptoms of agitation in Alzheimer’s disease. Reduce stimulation and minimize distractions in the room by turning off the television and playing soft, relaxing music. Some research suggests that agitation can be treated with antidepressants. If continued agitation is severely interfering with your loved one’s quality of life, ask your doctor for more information. Alzheimer’s disease interferes with neurotransmitters in the brain that impact mood. Depression is very common among people with dementia, particularly in the early and middle stages. It is important to make the doctor aware of any signs of depression so that proper treatment can be prescribed. Ask for a referral and make an appointment to see a geriatric psychiatrist who specializes in treating depression in older adults. In some cases, the doctor may prescribe therapy or an antidepressant to treat the symptoms of depression. Social isolation contributes to depression in people with dementia. To combat this risk factor, experts recommend introducing more socialization opportunities, such as scheduled outings. Taking your loved one to a favorite park or restaurant can provide a much-needed respite. Or simply ask a good friend to stop by for a visit. Cognitive disabilities associated with Alzheimer’s cause confusion which can create feelings of failure and hopelessness. Plan more opportunities for the person with dementia to achieve something small every day such as setting the table to help boost self-esteem. Confusion is the natural result of memory loss. 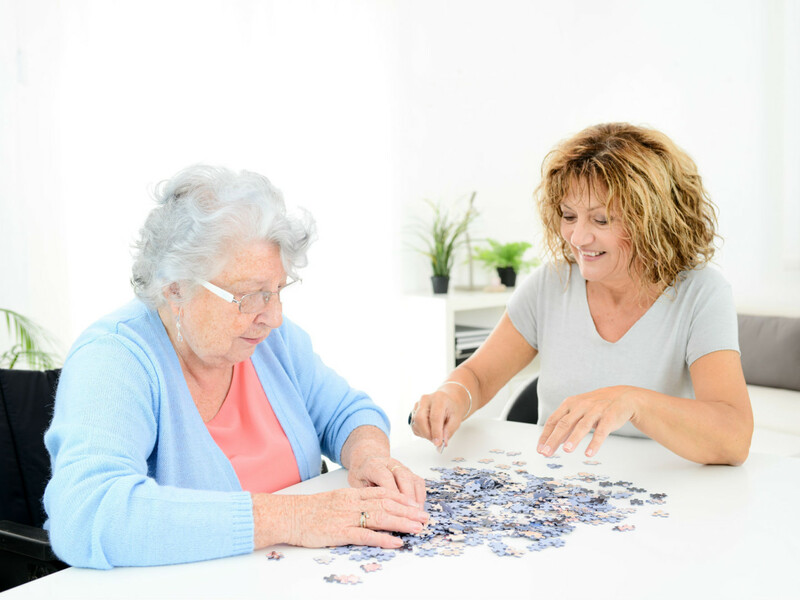 When a person with memory impairment cannot remember words to communicate or how to conduct activities that used to be accomplished with ease, it becomes a struggle to fill the gaps caused by forgetting ordinary tasks. Specialized memory care communities encourage people with dementia to use their retained abilities, maximizing feelings of freedom and control, while reducing opportunities for failure and feeling of confinement. Memory loss causes one to feel disoriented in the world, especially with regard to time and space. Use of visual aids such as clocks, watches or signs can help reorient the person and minimize confusion. Modifying the way you communicate with the person in your care can alleviate or even prevent confusion. Avoid talking in long sentences or giving lengthy instructions, which are more difficult to understand for people with dementia. 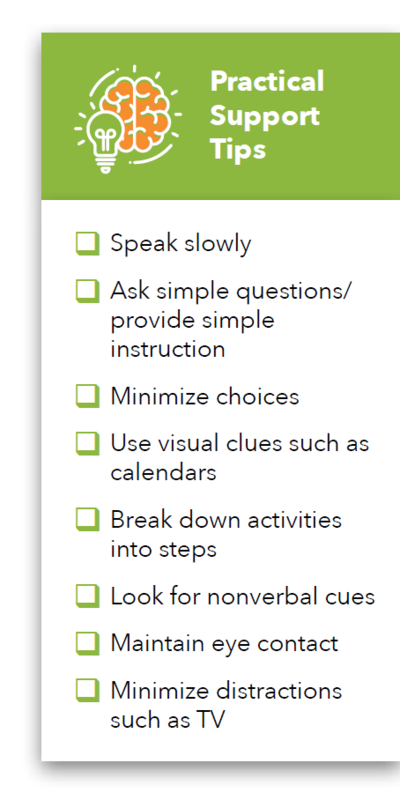 For greater success, only give one instruction at a time or break tasks down into small steps. 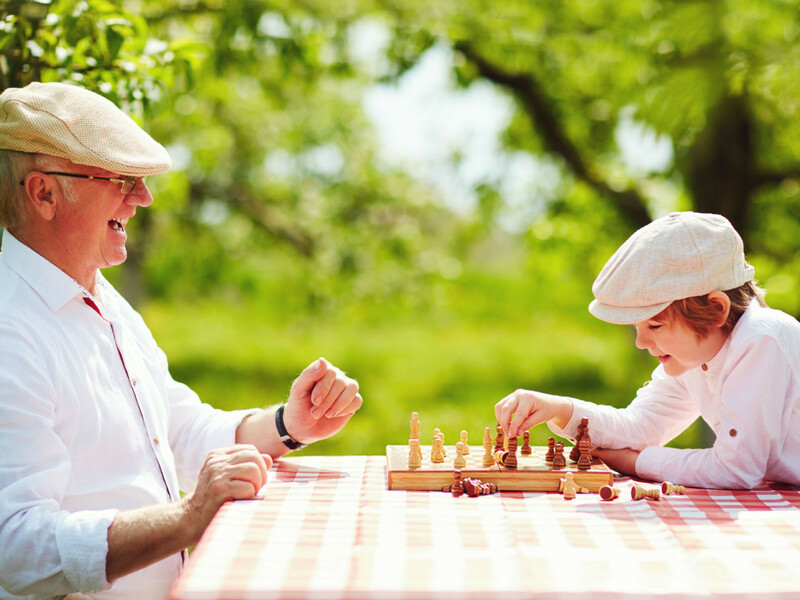 Activities are a fundamental aspect of purpose-built memory care communities since they help residents retain their independence and sense of self for as long as possible. Replacing the confusion with functional activities like folding towels can provide a distraction and help a person with dementia reorient themselves in the moment. Avoid attempting later in the day any complicated tasks which are better suited for the morning, such as bathing and running errands. According to the 2018 update to the American Academy of Neurology (AAN) Guidelines on Mild Cognitive Impairment (MCI), there are no FDA-approved medications for the treatment of MCI. Instead, most medical interventions focus on physical exercise, nutrition and brain health. Physical fitness and cognitive function have been consistently linked in research. Studies also show that exercise reduces agitation and promotes sleep. Start with a gentle exercise program that includes walking and gradually add activities such as dancing if they are well received. New experiences, longer sleep cycles, music, reading and even video games and social networking have been found to have a positive impact on brain health and cognition. In recent years, research has been focused on ways to maintain and even regenerate new brain cells and neural connections. In specialized memory care communities, brain training – or neurobic exercise – is often used as a technique to boost cognition. If and when cognitive decline progresses to dementia, it is important to get legal documents in order. Gather and organize documents such as insurance policies, birth and marriage certificates, deeds and mortgages, and a living will. It’s also a good time to assign a durable power of attorney for healthcare (DPAHC). Collecting and capturing memories in the early stages of cognitive decline will help you stay connected to your loved one. Explore popular online applications that help capture and preserve memories such as My Life Story and StoryCorps. Or, simply grab a video camera and make your own video. Swallowing is a learned reflex and people with memory impairment often “forget” how to swallow. People with dementia may be hungry, but often lose the ability to comprehend that hunger is the body’s way of signaling that one should eat. Memory challenges begin early in the disease, while the sensory memory of favorite foods will linger. Smells associated with familiar foods are known to trigger the brain, so serving food “family style” is a good way to stimulate appetite. Get out the bread machine or use a slow cooker and fill the home with appetizing aromas! Nutritious foods can improve the health and quality of life of those with Alzheimer’s disease. Providing lots of snacks and easy access to fruit, crackers and vegetables can stave off weight loss. The goal is to maximize opportunities for your loved one to make the connection between food and eating by availing it frequently throughout the day. 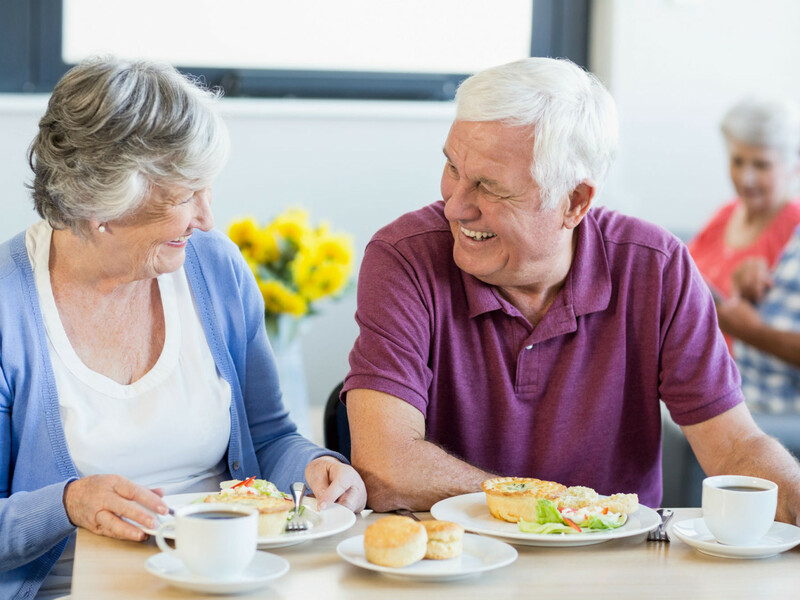 Changes in vision can prevent people with dementia from perceiving food on a table, because it typically sits below eye level. Experts recommend use of high contrasting colors to draw attention to plated foods. Serving mashed potatoes on a blue plate or brightly colored Fiesta® dinnerware, for example, is a popular strategy. The amount of food on a plate can be overwhelming for people with dementia. Finger foods and single-serve items can boost the desire to eat. Experts recommend serving food in a mug or on a piece of bread or tortilla to encourage eating while providing necessary nutrition. Safety is a common concern among caregivers, and for good reason. People with dementia are up to five times more likely to fall and become injured than those without memory impairment. Fortunately there are protective measures you can take to prevent falls before they happen. Preventing falls in the bathroom is paramount. Install grab bars, purchase a bath chair or bench, and install a hand-help shower and raised toilet seat. 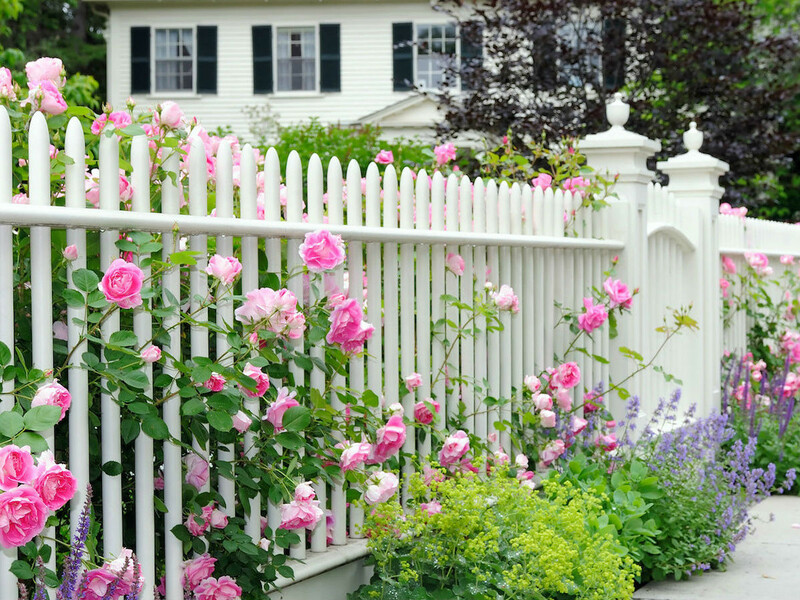 All of these home improvements will not only make your home safer, but make your life easier, too. High contrasting colors are simply easier to see. Experts suggest applying contrasting-colored tape and paint to serve as a visual guide. For example, black tape on the edge of a white tub enhances contour and is easy to see. Hard wood floors can be slippery. Experts recommend use of rubber-soled shoes coupled with non-slip stair treads to prevent falls. Avoid waxing the floor and clean up spills right away. Falls are less likely to happen in a well-lit home. Install lights in dark hallways and place nightlights at eye level to help your loved one navigate to the bathroom during the night. Move furniture against the wall and remove all clutter, including throw rugs, mats, and extension cords, to ensure all pathways in the home are free and clear. Trouble with sleeping is one of the more challenging aspects of dementia. People with dementia often get days and nights mixed up. Due to changes in the brain, the circadian rhythm is interrupted, and deep sleep, which the human body needs, is difficult to achieve. Exposure to natural light will assist with the body’s natural rhythm to wake and sleep! Open the drapes and make sure the lights are on during the daytime to promote wakefulness. 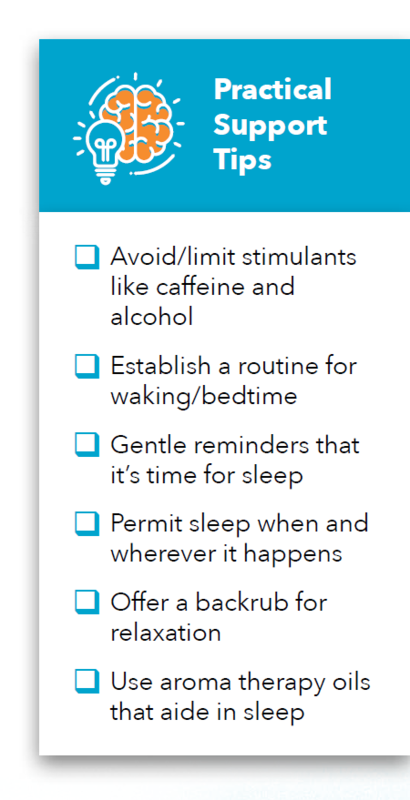 Adhere to daily schedules, since these may contribute to promoting sleep. Serve meals and shower at the same time every day to help establish routines that may ease transitions. Avoid or limit caffeine, a nervous system stimulant that interferes with the body’s natural adenosine level and blocks the brain’s normal sleep signals. Alcohol, a diuretic, also prevents REM sleep and leads to more bathroom trips. Allow sleep where and whenever it happens – in a recliner, sofa or bed. Like food, it’s important to let people with dementia sleep when they can and reset the body’s internal clock. Wandering – or the urge to pace or walk around – is a natural and common behavior associated with Alzheimer’s and dementia. Preventing wandering may actually increase negative behaviors such as agitation, so the key is to allow wandering in a safe and manageable way. Restlessness may be caused by an unmet need that the person with dementia is unable to identify or articulate. Offer food or beverage and a trip to the bathroom. Adjust the thermostat if it’s cold or hot. When wandering causes someone to become lost outside, particularly in the Florida heat, it can lead to a serious accident or even death. Allow safe wandering in the house, but prevent someone from venturing alone outside by using child-proof locks or doorknobs. At a minimum, install alarms that alert you when an exterior door is opened. Register with the Alzheimer’s Association Safe Return®program at www.medicalert.org/safereturn. The program includes a MedicAlert® ID bracelet or pendant, personalized wallet card, a personal health record, and 24-hour emergency response service, so that in the event your loved one were to get lost, a community support network consisting of law enforcement and medical professionals would be alerted to assist. As a precaution, notify neighbors that you have someone living at home with dementia, so if the person in your care were to wander outside and become lost, neighbors are able to assist. Dementia can exaggerate suspiciousness, which can result from memory loss. 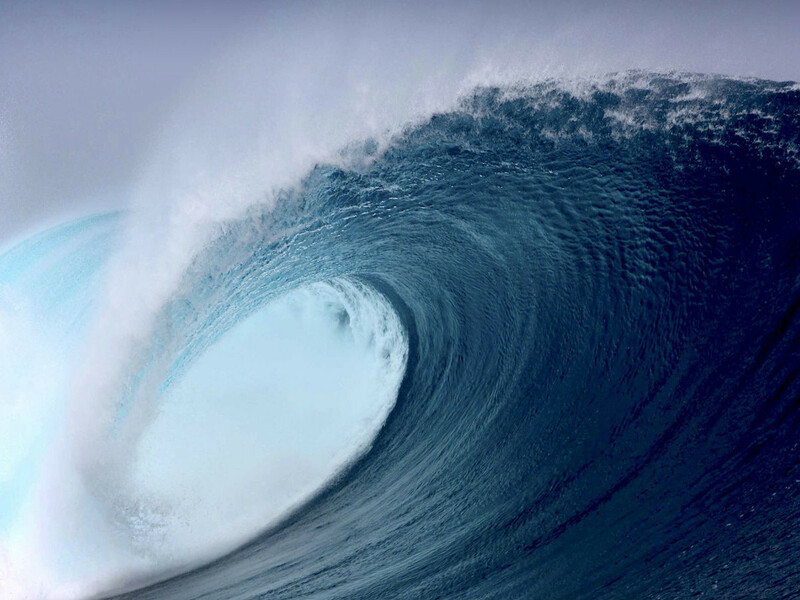 Rather than becoming defensive or upset, the best way to handle paranoia is to be patient and reassuring. Think about how you feel when you lose something important to you and reassure the person in your care. Tell them you are sorry the item was lost, but that you know how frustrating it is to lose something meaningful. If appropriate, offer a hug. Agree with the person in distress, listen, and redirect their attention, but do not argue or attempt to reason with them into believing something different, as this only leads to more unwanted behavior. Paranoia may cause a person with dementia to hide items, but also forget the location of the hiding place. Store valuables such as wedding rings safely away and out of plain sight. Avoid clothing with pockets and identify favorite hiding places in order to locate missing items. What once was an easy task can become a daily challenge for people living with Alzheimer’s and dementia. People lose the ability to manage buttons, laces and zippers, so making smart clothing selections will ease frustration. 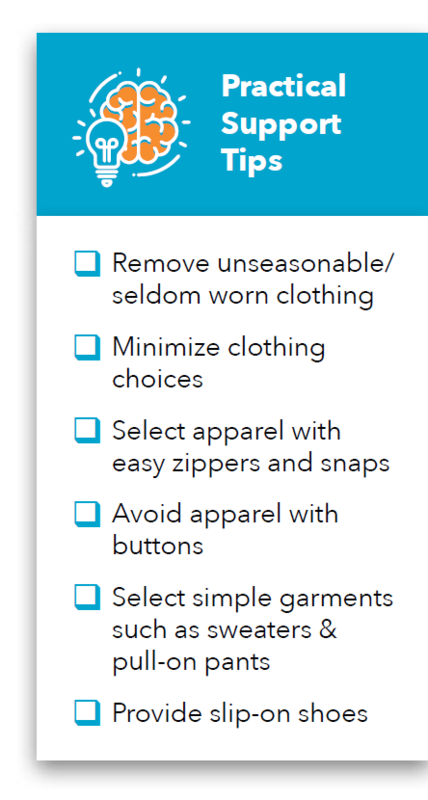 People with dementia don’t always complete tasks, such as getting dressed, in a natural sequence. In general, the fewer steps required to get dressed, the more independent the person in your care will be. Pull-on pants or trousers with elastic waists and tops – think sweat suits – are a practical choice for both men and women. Due to cognitive impairment, people with dementia cannot always react quickly to the sensation of needing to use the toilet. Specially designed clothing called adaptive wear can be purchased online and features easy fasteners such as Velcro tabs to help prevent accidents. Remember that dementia is a disease that causes damage to the brain. Brain impairment creates confusion which triggers a litany of other behaviors that can be distressing to both the person responsible for caregiving and the person in their care. There’s no one test that diagnoses dementia or Alzheimer’s disease. It’s based on medical history, physical and neurological exams, lab tests, brain imaging, symptoms and behaviors. If you need help, do not wait until you are exhausted or sick. Build a support system early on to establish familiarity with other caregivers. Or, consider a day stay at a memory care community to give yourself a break from the demanding role of caregiving. 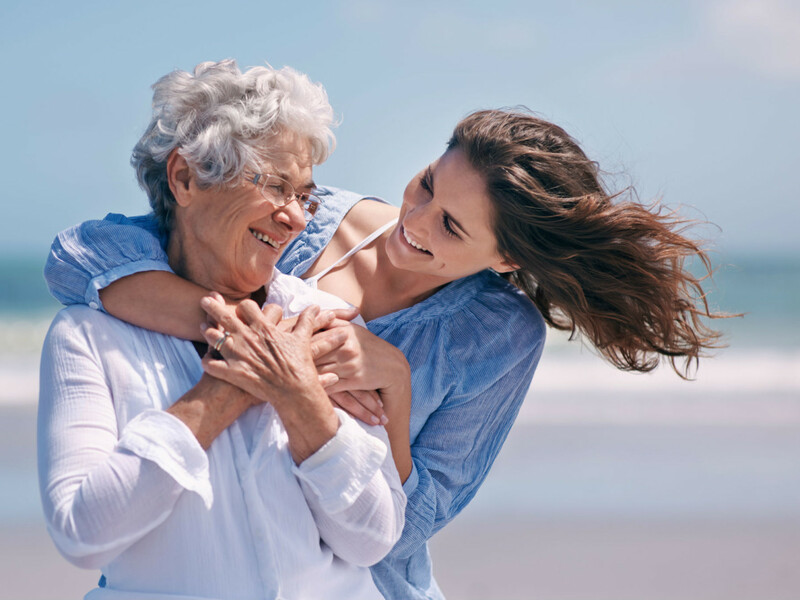 A memory care community will help your loved one feel connected and engaged with life while you take a needed break to preserve your health. Alzheimer’s is a progressive disease. It is important to recognize that your loved one may eventually require care beyond what you can provide on your own. Serenades Memory Care communities provide assistance, resources and the highest level of certified dementia care if and when you need it. Information featured on this page is for informational and educational purposes only. The information provided should not be considered a substitute for individualized medical assessment, diagnosis or treatment by your medical provider or physician. If you or someone in your care has a medical problem, contact your medical provider or mental health provider. Being diagnosed with a dementia like Alzheimer’s can obviously create a lot of stress, but did you know chronic anxiety can also be a contributing cause of dementia? Brain-boosting exercises have become popular lately, particularly among older adults hoping to prevent age-related memory loss. That’s why we did some digging to see which, if any, cognitive training interventions actually work. 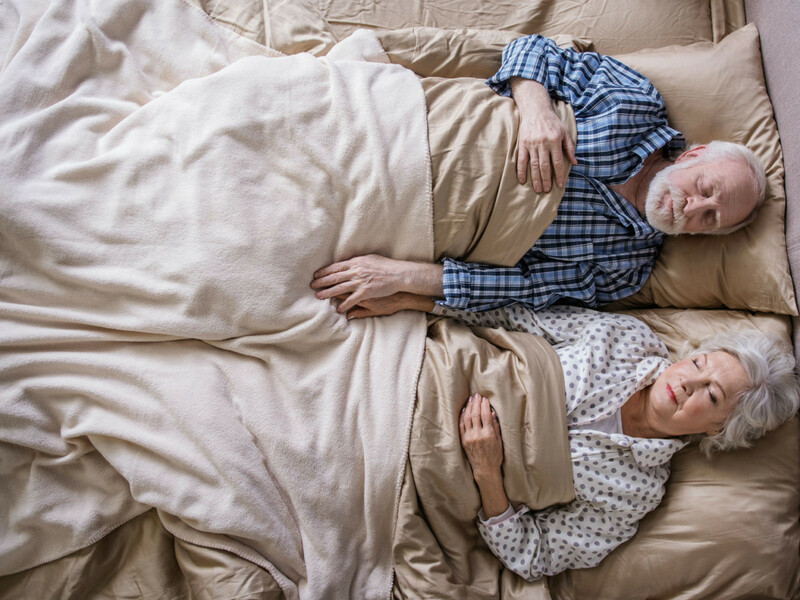 Trouble with sleeping is one of the more challenging aspects of many types of dementia, including Alzheimer’s, both for your diagnosed loved one and for you as their caregiver. If they’re not sleeping well, neither are you. Sonata Senior Living, an Orlando-based owner, developer and operator of senior living communities, announces the construction of a new state-of-the-art memory care addition at Sonata Vero Beach. Serenades Memory Care at Sonata Vero Beach is scheduled to open on June 1, 2019. Despite its year-round sunny disposition, Florida bears the second highest incidence rate of Alzheimer’s disease in the nation, second only to California. And it’s growing at a record pace. If your parent or partner was recently diagnosed with Alzheimer’s or dementia, you may find yourself in uncharted territory. Perhaps you feel insecure and anxious, unsure of how to manage the symptoms of Alzheimer’s and dementia at home.